Moving into a new home is an exciting life event! But like all exciting life events, it can be peppered with a few chaotic hiccups as you begin to wrap up your entire life, shove it into a box, and transplant it into a brand-new environment. 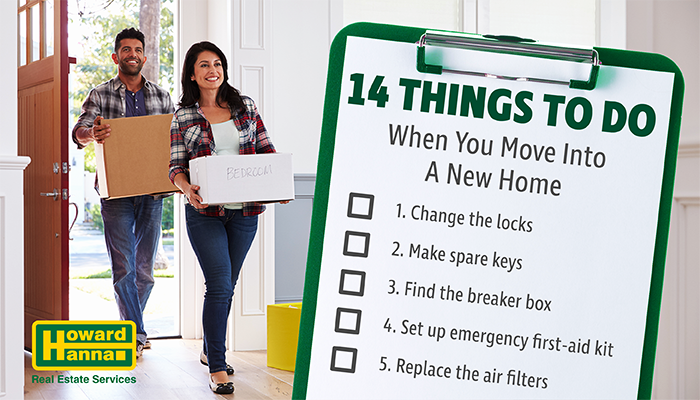 To help ensure that you have an easier transition from your old home to your new home, we’ve compiled a general To-Do List of things that should be done as soon as you move into your new home. These tasks may seem banal and simple, such as figuring out where the breaker box is in your house, but each one is essential in the event of an emergency, such as when a tripped circuit shuts off all the power in the bathroom. Showering in the dark is not an experience we wish upon anyone. So take a moment to familiarize yourself with your new home! Change the locks on all exterior-facing doors. This includes your front door, your garage door, and your back door. You never know who may still have a key to the house, or if a spare key was accidentally left somewhere in the yard, and you certainly don’t want unwanted visitors in the middle of the night. Make spare keys to go with the new locks and test those keys. Even professional key-cutting machines can make a minor mistake; it’s better to know your key doesn’t work when you’re able to go get it fixed immediately, than to be stuck outside of your house at midnight waiting for a relative with a working key to get home. Clean the house. This may seem silly—I mean, you’re moving into a brand-new home, of course it’s clean! Isn’t it? Not necessarily. If it’s a new construction home, dust may have gathered in the vents and is just waiting to be blown all over the place. If it’s an older home, there may be grime or pests in unwanted places, such as cabinets where dishes are to be placed. Best to be safe rather than sorry! Wipe down all doorknobs, light switches, and toilet handles with disinfectant (maybe a former resident had pink eye, you never know!). Wipe out the inside of cabinets and cupboards. Check that all appliances function properly. For example, make sure the fridge is running properly and the freezer is actually cold, ensure all kitchen appliances have been plugged in, that the washer and dryer have been set-up properly, etc. Check the plumbing. Flush the toilets. A proper home inspection should have caught any potential leaks, but it’s always good to double-check the pipes under the sink and make sure the faucets don’t leak. Identify where the shut-off valve for plumbing is located. Locate the breaker box. If it’s in a part of the house that doesn’t receive any natural light, be sure to place a fully-charged flashlight in the area. Check the smoke detectors and carbon monoxide detectors. Make sure that they don’t need new batteries. Set up an emergency first-aid kit in an easy-to-reach location. While moving in, there are plenty of opportunities for something to go wrong, from a bad box-opening to dropped dishes. It’s good to have the emergency first-aid kit immediately on hand from the get-go. Switch out the lightbulbs for ones you prefer. If you’re not a fan of the soft-yellow light that most lightbulbs emit, or have a particular energy-efficient brand of lightbulbs you like to use, set those up as soon as possible so you can work happily in the type of lighting you enjoy. Make sure your house numbers are clearly marked and visible. Inform friends and family of the address change. Ensure your address has been updated where applicable. Update your driver’s license and voter registration. If you’ve moved to a new state, also get your car registered in the new state. Make yourself at home and say hello to your neighbors! If you haven’t moved yet and are just beginning to pack up your home, be sure to download our free Moving Checklist, which includes what to do the day before moving and on moving day itself! In addition, for families moving with young ones, our blog, Tips for Moving with Children, offers insight on how to make the moving process easier for children and even includes a free coloring book/journal to help children acclimate to moving. Are you a first-time homebuyer? Read our guide today! Moving doesn’t have to be stressful or headache-inducing. At Howard Hanna Real Estate Services, our goal is to help you make Home Happen Here.® If you’re moving to a new area, our global and local Howard Hanna Relocation Services can also assist you with the relocation process. With our one-stop shopping, we also offer real estate services, mortgage services, title and escrow services, and insurance services, taking the worry out of moving by walking you through your entire home buying or selling experience. I like the last point about neighbors. That’s very important to be friendly with neighbors.